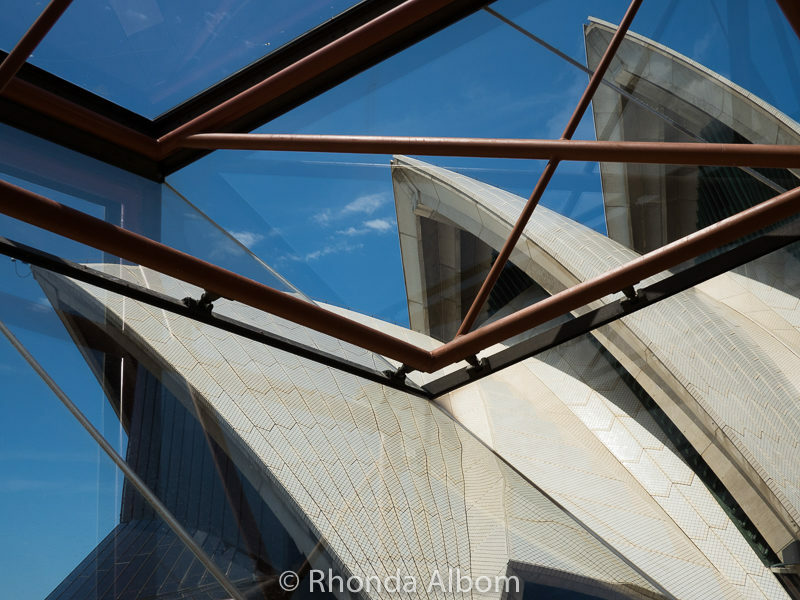 There is something magical about the Sydney Opera House on a sunny day with its sail tiles glistening against a blue sky. This was our third trip to Sydney Australia, and the first time we went inside the Opera House. It wasn’t to see a show, although we were quite tempted to see My Fair Lady directed by Julie Andrews. Instead, we opted for a tour inside one of the world’s most recognisable buildings. 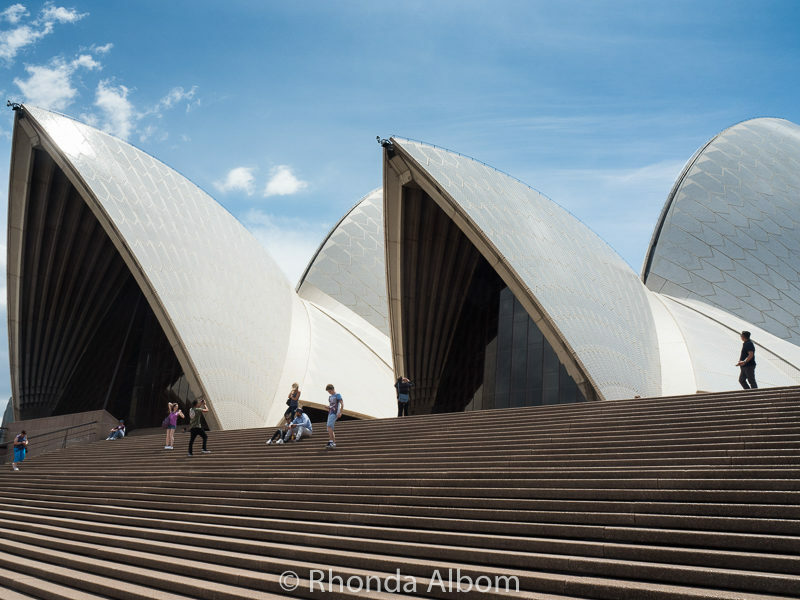 The Syndey Opera House is an engineering wonder, a UNESCO world heritage site, and nothing short of spectacular. 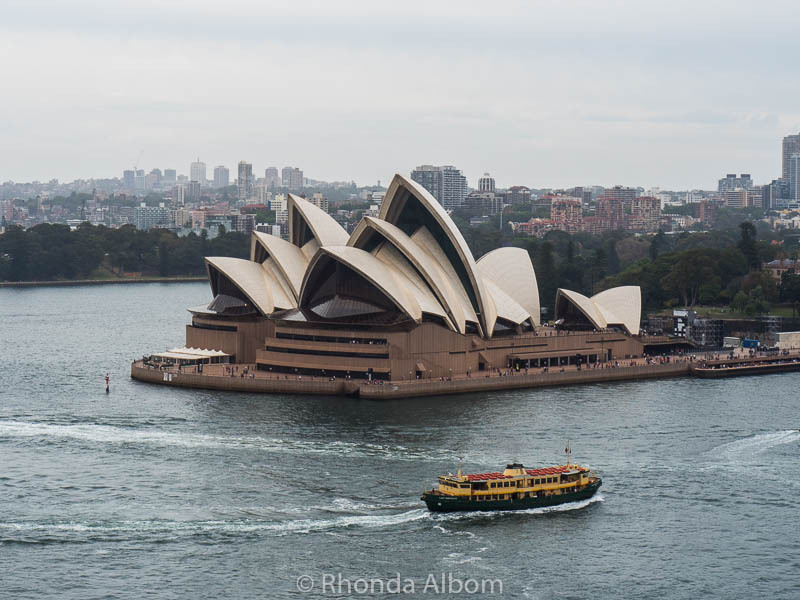 Designed by Jørn Utzon and opened by HRM Queen Elizabeth II in October 1973, today the Sydney Opera House is the busiest performing arts centre in the world. We are just two of the 8.2 million visitors expected this year. The land in which the Sydney Opera House is built upon is known as Tubowgule, which translates to “where the knowledge waters meet.” It is the land of the Gadigal Clan and therefore, we began our tour by honouring Aboriginal protocol and acknowledging the Custodians of this Gadigal country. 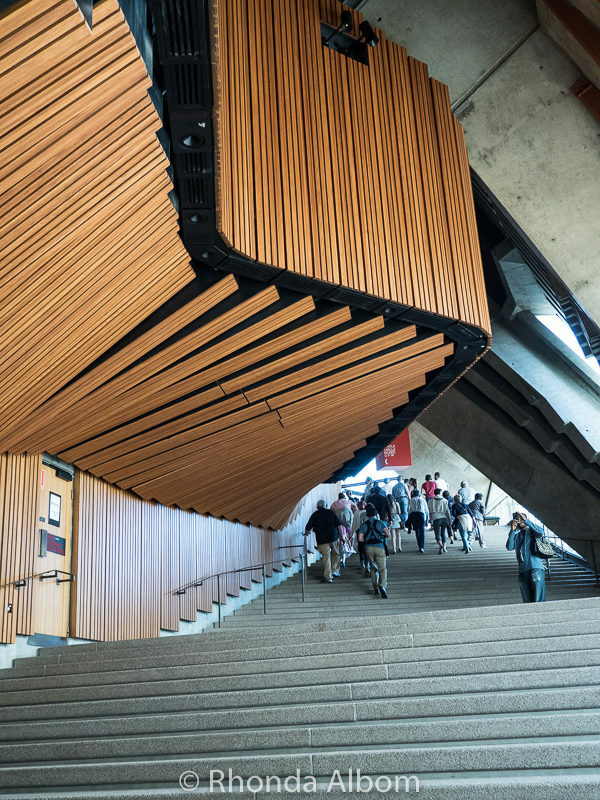 Our first stop inside the Sydney Opera House was the lower Colonnade, home to three theatres: the Playhouse, the Studio and the Drama Theatre. Of the three theatres, we were only able to enter the Studio and no photos allowed inside. Too bad, as it’s an impressive theatre used for a huge variety of events from a Coldplay recording session to an APEC round table conference. We quickly discovered on the tour that many areas of the building are off limits as they are in use, either holding rehearsals, in a live performance, or they simply have proprietary decor on display for a current or upcoming production. However, we did get into a few theatres and halls, learn about the history, and discover the attention to details in foyers and other public areas. There were limited photo opportunities inside the theatres, but the photos of the foyers were fine. One of 9 large windows in the Colonnade. The angled window-wells make the windows appear larger and cut down on glare. Getting inside and learning about this striking concert hall was the highlight of my tour inside the Opera house. The hall’s total capacity 2,700 people including up to 700 on stage. The concert hall is designed for instrumental sound and produces incredible acoustic tones. White birch wood is used for the walls as well as the seats for acoustic enhancement. The lit glass saucers over the stage raise or lower to distribute the best sound. The organ displays 138 pipes in front and over 10,000 pipes in the rear, making it the world’s largest mechanical tracker-action pipe organ. We were the last tour group to get into this hall for the day, as rehearsals began as soon as we left. PRO TIP: Schedule your tour as early as possible during the day, before many theatres are in use. 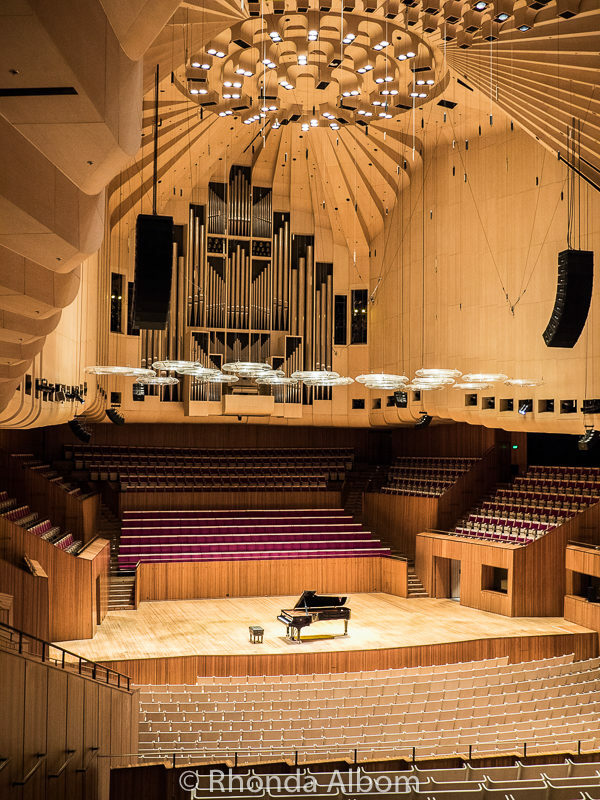 Inside the Sydney Opera House concert hall. We visited the foyers of several of the other theatres, each with unique features and views. They are used before performances, at intervals (intermissions), and often are the main party hire (rental) venue. 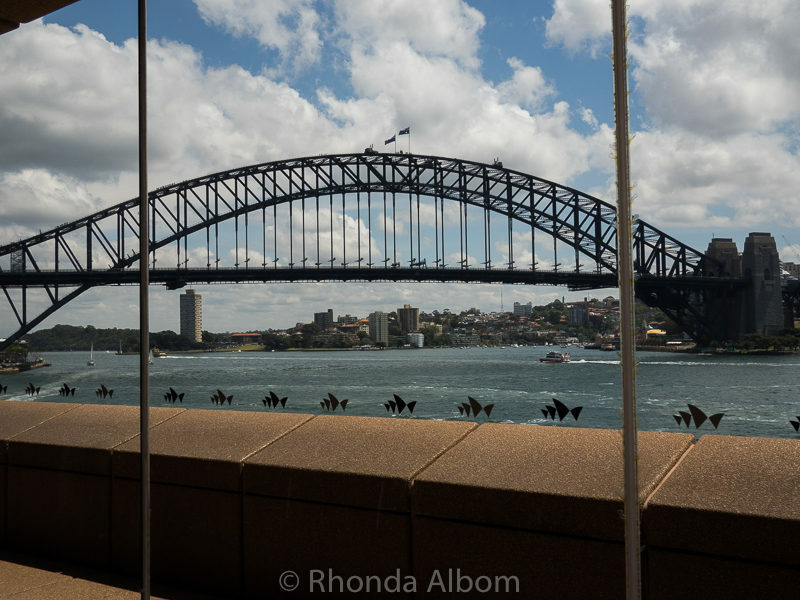 The Sydney Harbour Bridge as seen through a foyer window. Looking at the foyer from another angle, we can see the structure around the concert hall above and behind our tour guide. Angled glass and metal framing in one of the foyers. A view of some of the sails from a foyer window. 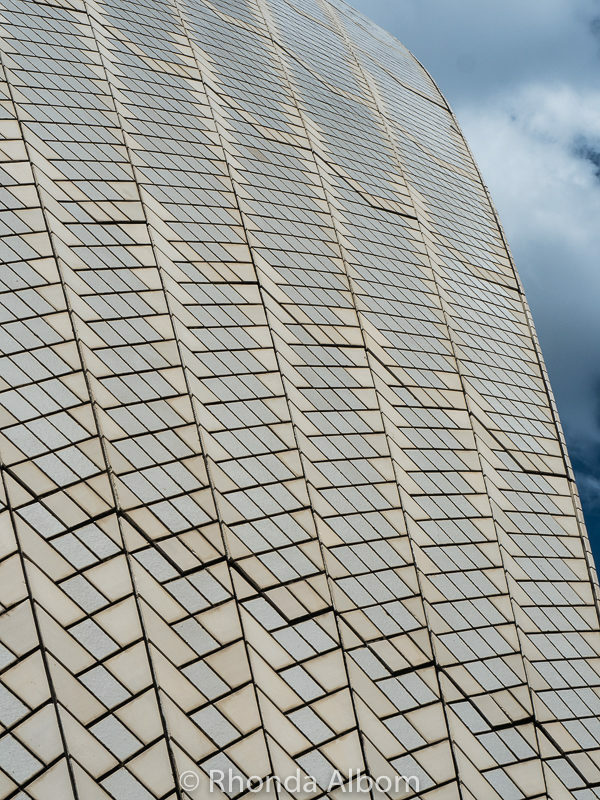 Finally, we headed outside for a closer look at the one million Sydney Opera House tiles that make up the iconic sails. The tiles are not all the same. To create the effect, they used two colours and seven varieties of tiles, with both shiny and matte finishes. One final shot at the end of our tour of the Sydney Opera House. The day after our tour we explored more of Sydney. This included a walk across the Harbour Bridge. Not the heart-pounding adrenaline walking tour over the top, but a gentle walk on the footpath on the same level as the traffic. As we approached the other side, I captured a different view of the most famous opera house in Australia. View of the Opera House from walking across the Sydney Harbour Bridge. The one hour Sydney Opera House tour that we took, is available daily between 9 am and 5 pm. Advanced booking can be made clicking here to schedule a guided tour. Or get the total experience and take a tour with a show and dinner included. 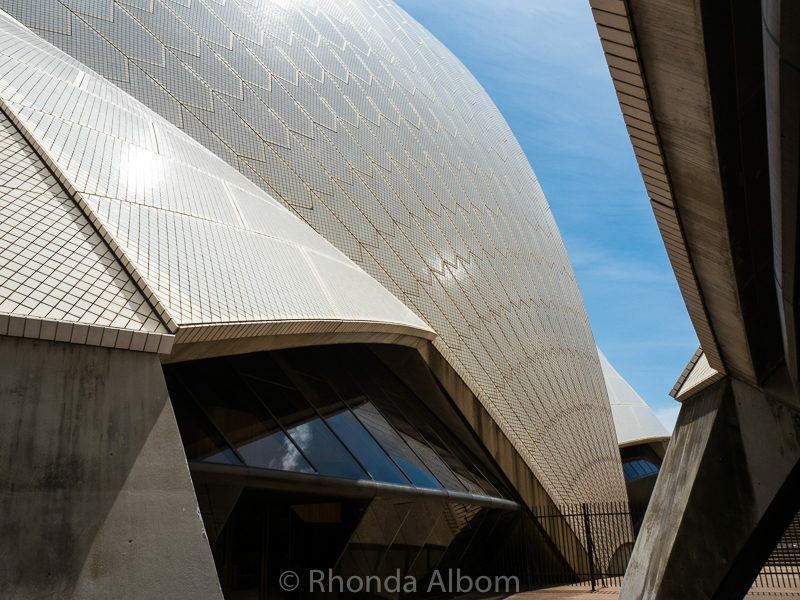 If you are visiting Sydney as a cruise port, check out this shore excursion guided tour of the inside of the Opera House. 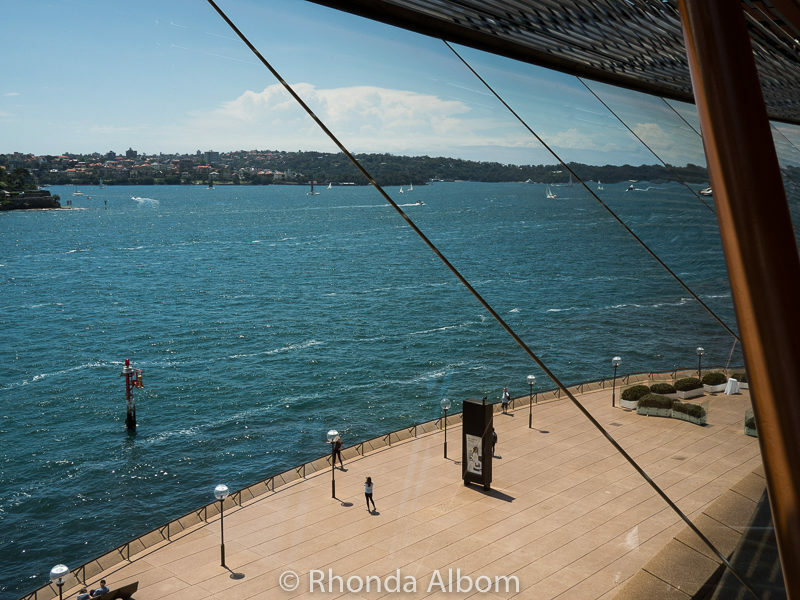 Our tour highlights were getting into the concert hall and the Studio, learning a bit of the opera house history and discovering how smoothly the three sails work together. 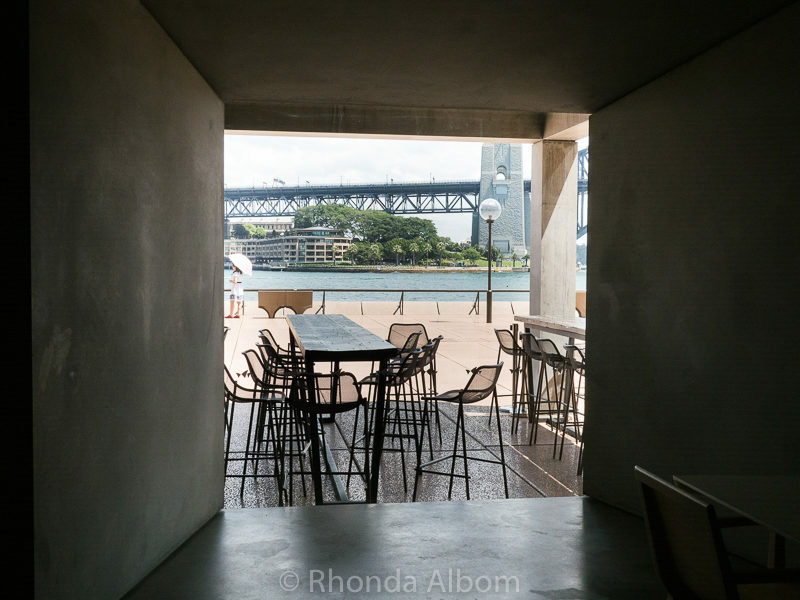 There are plenty of restaurants surrounding the Opera House and several must eat foods in Sydney. 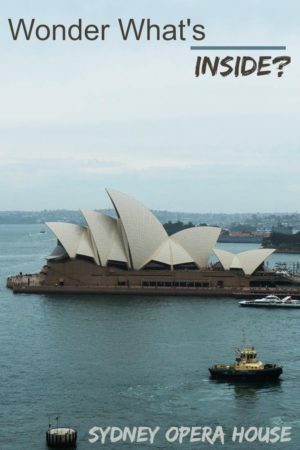 Find the Sydney Opera House schedule on their official website. 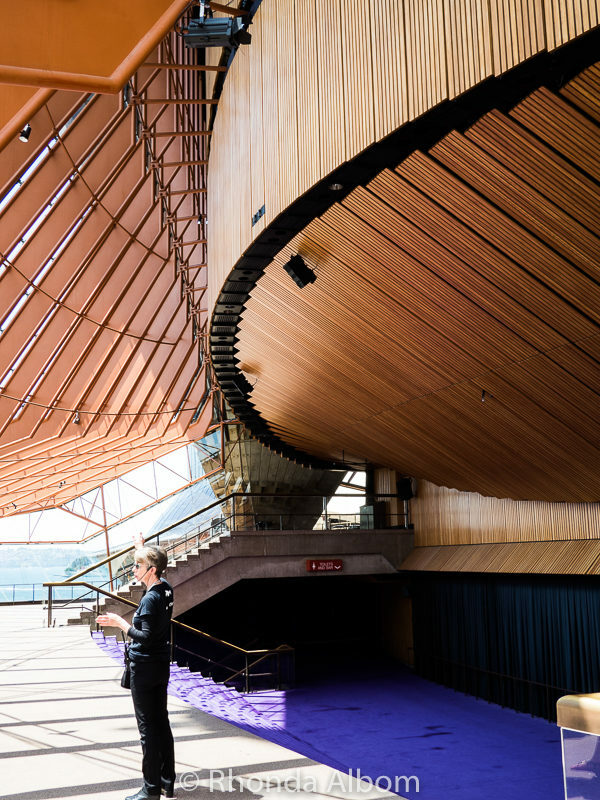 Have you been inside the Sydney Opera House? Did you see a performance? Disclaimer: To assist in the writing of this page, we were provided with a complimentary tour. As always, the opinions expressed here are strictly my own. Can’t wait to visit the Opera House building! Now let’s start saving XD Australia isn’t known for its budget travel options. You are correct, Sydney is not a cheap city, but one of my favourite places to go. Such a beautiful city, with a fabulous waterfront. Thanks, I always wondered what it looked like on the inside. I’ve never been inside the Sydney’s Opera House but it truly looks interesting to me! Hope to make it there next year. Would you recommend any nice cafeterias around the place? We tried a few of the cafes in the area and all were fine. We also like eating in the Rocks. 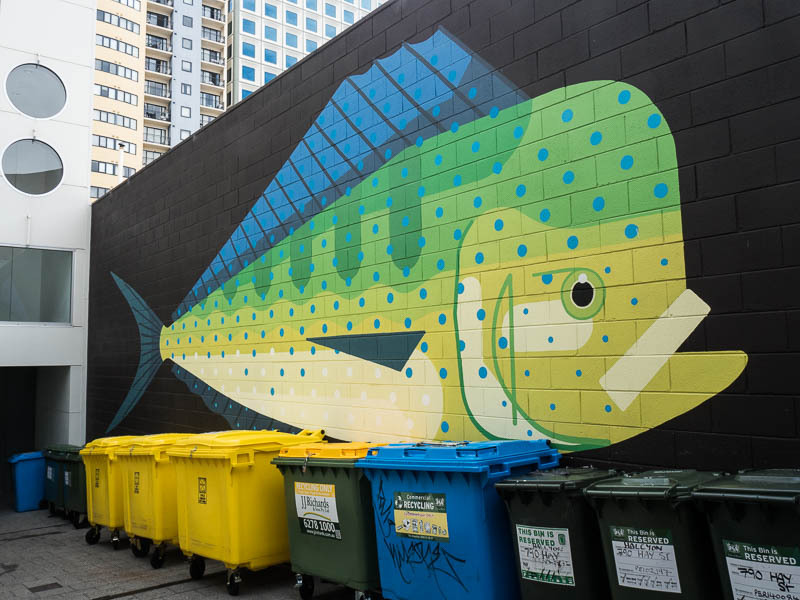 Our two favourite restaurants in Sydney are dinner time: Mr. Wong for Chinese food (be prepared for a long wait, but worth it) and Meat and Wine Co – make a booking for this one. Very true, this should be on everyone’s Sydney must-see list. Jutting out into the water on that spit of land, it’s hard to miss the exterior. 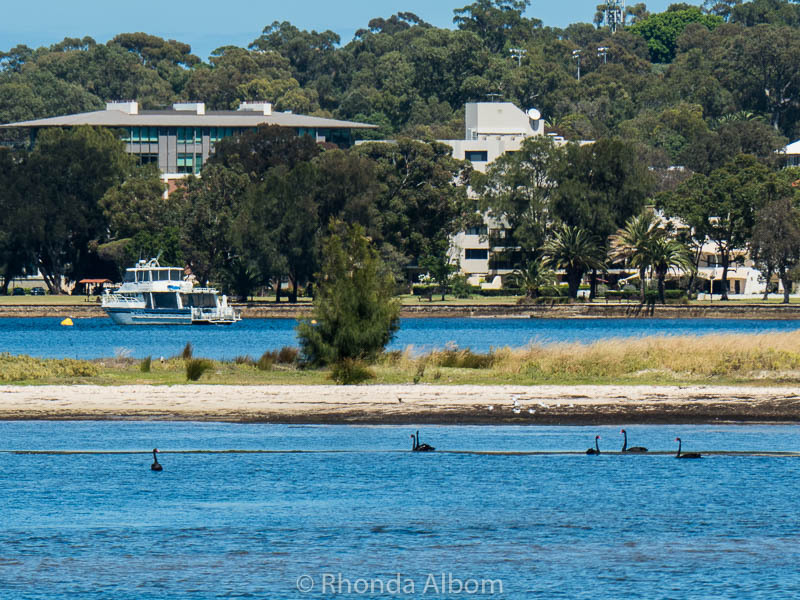 You can see it from so many of the tourist areas in the city, plus the main ferry terminal. Fewer people get inside. 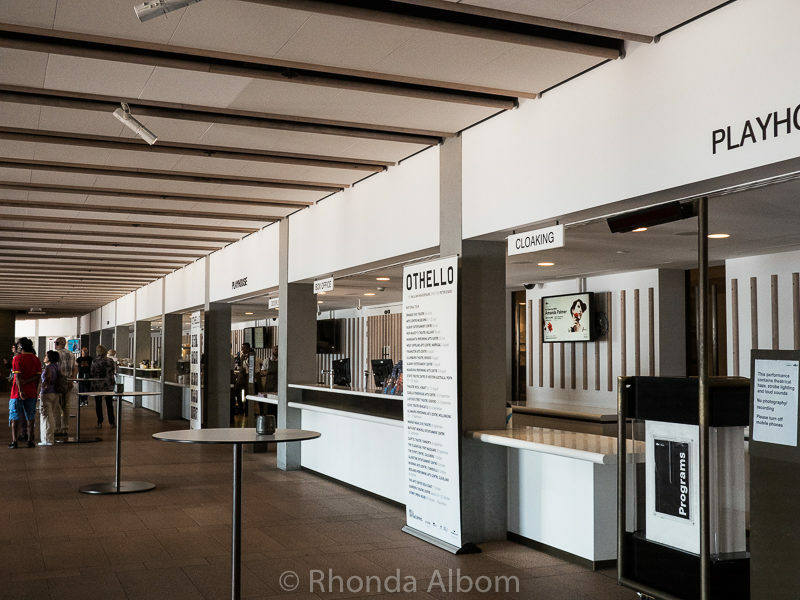 I haven’t been to Sydney Opera House and I thank you for sharing your photos of the inside of the opera house. It was great to see it via your article! I remember visiting the Sydney Opera House when I was in High School. I was absolutely smitten. I would love to see a show there. It is such a fascinating shape and the contrast against the blue, it’s easy to fall in love with it. I always see pictures from the outside but never the inside so it’s great to see it! I need to travel to Sydney sometime soon, it’s been on the list for ages and it’s only a stone throw away from NZ! I love Sydney as a weekend getaway destination from Auckland. It is such a lovely city, and the view of the Opera House and Harbour Bridge are really magical. I hadn’t either, it sure is as amazing inside as it is outside. And thanks, Carmen. Stunning photos! I haven’t visited the Sydney Opera House but I think of it as a city icon. I had no idea it is a UNESCO site – very cool. I appreciate the travel tips and will plan to book a tour when I visit. Thank you! Nancy, Sydney is an amazing city and the views of both the harbour bridge and the Opera House are incredible. You are so lucky to live so close that you can see it often. Enjoyed your photos! I went to Sydney last year and walked around the outside of the Opera House, but never made it inside. The architecture inside is mesmerizing. Loving the use of birch wood in the concert hall. I’d love to see a performance there sometime. I really hope I get to sit in that concert hall and enjoy a performance one day too. Yes I have and it is truly one of our great icons isn’t it. I love that decades later it is still something that is recognised all over the world. Would have loved to have been outside a few weekends ago when Crowded House played there. Yes, it is an amazing place, inside and out. I am just glad I finally got inside. I think it is part of the reason I love Sydney so much. Seeing the Opera House always makes me feel happy. I would have loved to have been there when Crowded House was playing too. I’ve only been to Sydney once and it was a short trip, so I’m eager to go back. In that trip I got to go on a boat trip and only saw the opera house from the exterior. It’s an extraordinary building! So glad I read your post and go to have a glimpse from its interior. How amazing is the concert hall?! I so badly want to go back and enjoy a concert there. It is truly amazing. Thanks. I loved walking across the bridge. It is the first time we did it, but it won’t be the last (assuming I get to Sydney again). I love the photos of the opera house, and the idea of My Fair Lady directed by Julie Andrews (really? ), but you got my full attention when you said you love yacht racing. As a participant or a spectator? When I took my young brother, who was then 14, to visit Australia in the 70s, we did see a play at the opera house, but my favourite part of the whole trip was the day we booked to go out on a sailboat and she turned out to be the prize-winning America’s Cup racing yacht Gretel, on her first day as a tourist day-sailer. One of the original crew was aboard that day and I spent a lot of time with him while my young brother learned about all the fixtures aboard a racing yacht. I race on small yachts at our local yacht club. The boats are generally between 26 and 42 ft, and each has a handicap to make it fair. I crew on one of the larger boats. Auckland also has two America’s Cup boats that they take out every day with passengers. Looks like loads of fun. Rhonda, I’ve never been to Sydney! Two trips to Australia and we bypassed it both times. Next time we go, after we retire, we’re buying a car and staying as long as we can to tour the country. We’ll go then. I would do this tour, because I love all things architecture. I might have to see a show, though. I’ll have to plan that one just right wont’ I? I love Sydney, but I also love everywhere we have been in Australia. Each city and region seems so unique and has so much to offer. We really enjoyed our tour of the Sydney Opera House. I was so familiar with how it looks from afar but the close up view and the insides were a revelation. We did see a children’s glow-in-the-dark puppet show in one of the smaller theatres whilst we were there. The other memorable moment was when my daughter accidentally knocked over a display of Swarovski topped pencils in the gift shop. Many of the crystals popped off, and I ended up having to buy (at cost) over $100 of damaged pencils. About 25 pencils, in case if you were wondering. OMG – I can’t imagine that moment as you saw the glass about to break, yet couldn’t stop it. I think all parents have those. I had no idea the place was so big nor that it had so many different theaters. I’m stunned about the 700 on stage and the 10k organ pipes. My mom was an organist and would have love playing it or even just seeing it! Am I awful that I think it’s a bit rude to be force-fed aboriginal history and traditions upon entrance? If they did that with Native Indians in the US, I’d be resentful. Like maybe they originally owned Manhattan Island, but they participated in nothing that was built or is there now. If I was touring a reservation or Indian museum, I’d expect to learn about them, but just because land once belonged to you shouldn’t give you a say in how it’s used or force visitors to learn about your history. I think the big difference is that the native Americans sold the Manhattan to Europeans, where in the case of Australia (and New Zealand) the European’s stole it. Now there is a push in both countries for political and cultural sensitivity. LOL – I was a bit sad we made that choice too, but we didn’t have enough time in Sydney once we discovered it. As we were leaving on a cruise ship, there was no opportunity to extend. One of my favourite places to visit! Glad you enjoyed it! I imagine everyone enjoys this icon of Sydney. It really is beautiful, and looks so different from close up. It’s beautiful, and i hope i can see it in person someday. I hope so too. It is really special, almost magical. I have been to an Opera, many ballets, concerts and plays over the years at the Opera House but never done a tour. If you are ever in Sydney again and decide to see a show, take my advice and don’t just see a play. The drama theatres are underneath the main building and not nearly as impressive as the concert halls. That is exactly what I thought as I stood in the concert hall. I would love to see a show there. There was a single grand piano and stage and I imagined George Winston (my favourite pianist) sitting there. The concert hall also have the wow factor! It was really powerful to stand there. A rehearsal was going to start soon, so we may have been the last tour group to get into that hall for a while. There is always next time. I would love to live in Sydney some day. I’ve been to this fabulous city and attended an even inside this building- fantastic! meant to say “event” ! I was surprised too that Julie Andrews was directing. There was something exciting about just knowing she was in the same building I was standing in, even if I never saw her. I would have loved this tour. This building is awesome. So appealing. I would also love to see a play here. I would love to see theatre here, maybe a music concert as the acoustics are supposed to be so perfect. I had no idea the roof was covered in tiles…so gorgeous. I wish you would have gotten to see more theaters too; so I could see them. Shame you couldn’t take pictures of one of them. I wonder why that was. I knew it was made of tiles, just not so many. It is such an interesting building, loaded with little surprises. Next time I hope to see a show there. I hope you get too. For now I can tempt you. Thanks for the info on the Sydney Opera House. Nice job reporting on this. Quite an impressive structure. I’m now interested in going to Australia!! Thanks Curtis, but remember, if you get to Australia to add on a long visit to New Zealand. The inside of the opera house looks like the inside of our Walt Disney Concert Hall. LOL – Is that a hall inside Disneyland, or a separate building? I’ve always wondered what it looks like inside. It’s gorgeous! It really is as interesting and beautiful on the inside as it is on the outside. When we were in Sydney we sat on the stage at the Concert Hall to listen. So that’s what it looks like up close and personal. I’d love to see it from the inside! When you come and visit me in New Zealand, you can add a trip to Australia and check it out for yourself. Sydney is one of my favourite getaway destinations. Thanks! I always wondered what it looked like on the inside. Thanks for joining me via armchair. View of the Opera House from walking across the Sydney Harbour Bridge. It is so beautiful and every time I see a picture about Australia, the Opera House is in the background especially if the photo is taken from the Harbour Bridge. Maybe some day I’ll see for myself. See it Rhonda. 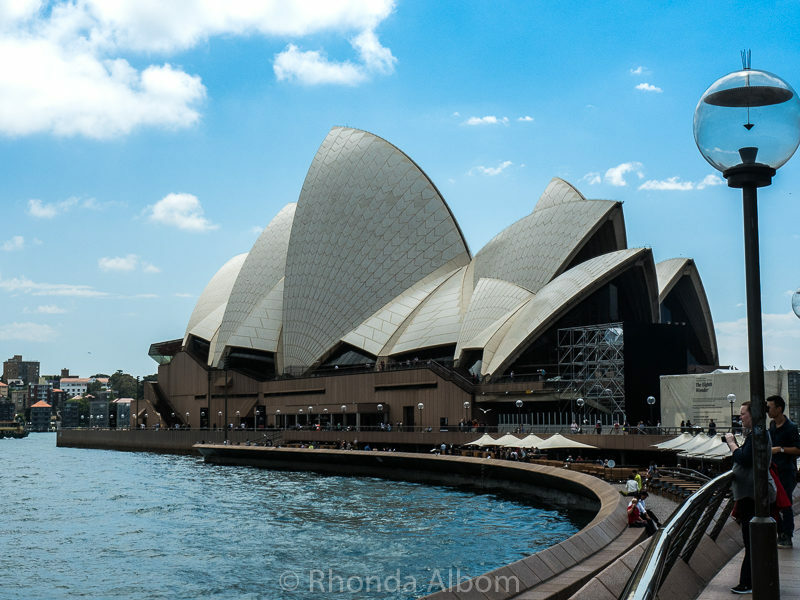 The opera house is an icon, and probably the most recognisable symbol of Australia.